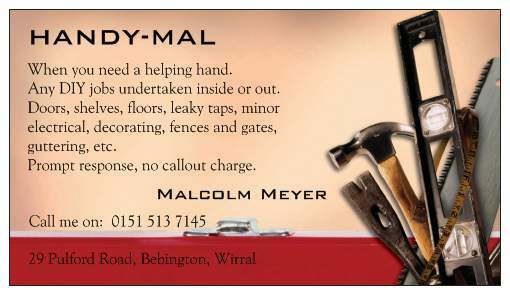 A one-man business providing handyman services to local residents and small businesses. All those d-i-y jobs that you just can't tackle yourself, inside or out. Joinery, plumbing, electrics, gardens, etc. No job too small. No callout charge. Reasonable rates. No obligation. Free quotes. Based in Bebington, I provide a prompt and reliable service throughout the Wirral area. Please call me for further information.